“Feeling artichoke-y.” It’s a new phrase that I’m coining. Right now. You read it here first. Sometimes I feel like an artichoke – a bit ornery to handle; patience is required to effectively pluck the prickly leaves protecting my heart. It’s possible that the person who asks me how I’m doing when I’m “feeling artichoke-y” will take me for a complete loony bin when I reply. Let them think what they will! There is just enough flesh on the leaves of an artichoke to have an excuse to liberally dip each one into a favorite sauce, scrape every edible fiber off with the back of your teeth and observe as the plate starts to look like a decimated succulent plant. 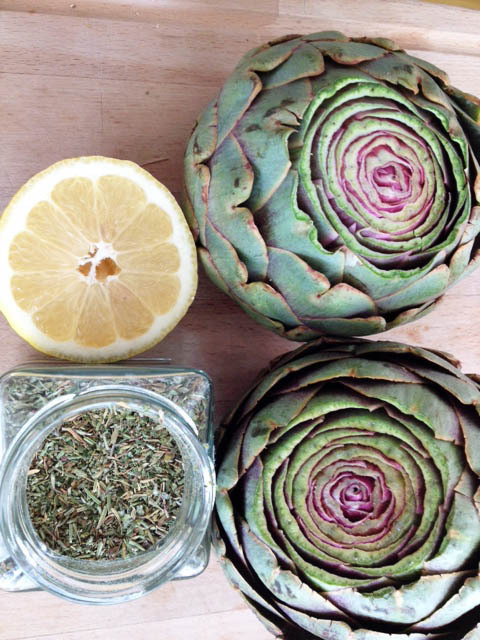 And, it turns out that artichokes are full of good things for us, like magnesium, potassium and fiber. But the best part of an artichoke, without a doubt, is its heart. It’s substantial enough to require a knife! Its distinctive flavor satisfies! It is so very worth it! I like them simple. Steamed. With a good sauce. 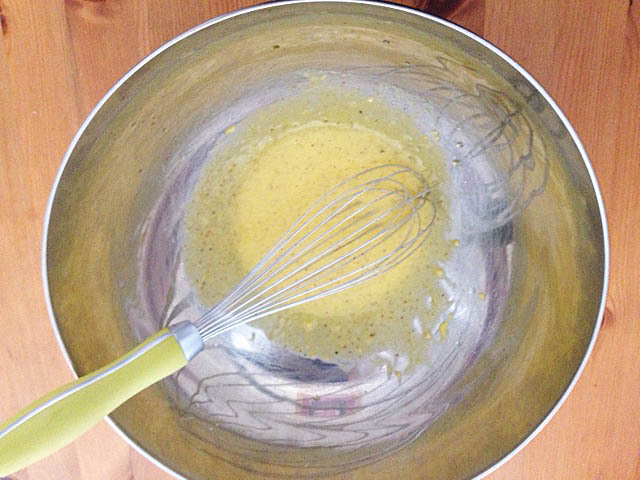 Whisk the egg yolk, garlic, salt and 2 teaspoons water in a medium metal bowl to blend well, until a bit foamy. Whisking constantly, slowly drizzle in the oil, about a teaspoon at a time, until the sauce is thickened and emulsified. Whisk in the cayenne, lemon juice, dijon, and few pinches of pepper. Taste and season to your liking. Prepare the artichokes. Cut off most of the stem, prune away the bottom leaves and chop off the upper part of the artichoke. You don’t have to chop off the top, but I like they way it shows off the artichoke bloom. In a large pot, bring the broth to a gentle simmer. Squeeze in the lemon and toss it in the broth. If you want to have small flecks of herbs nestled between your artichoke leaves, then add a few generous pinches of some dried herbs – Herbes de Provence work well. Add a splash of white wine if you’ve got a bottle open. Put the artichokes in, stem up, cover and simmer for about 30 minutes or until a leaf easily pulls away from the stem. Time will vary by size of the artichoke. Serve warm with the aioli and roasted potatoes or crusty bread. This is making my mouth water! I love reading all of your recipes. YOU ARE SO GOOD AT THIS!!! Amazing! Loving this post! 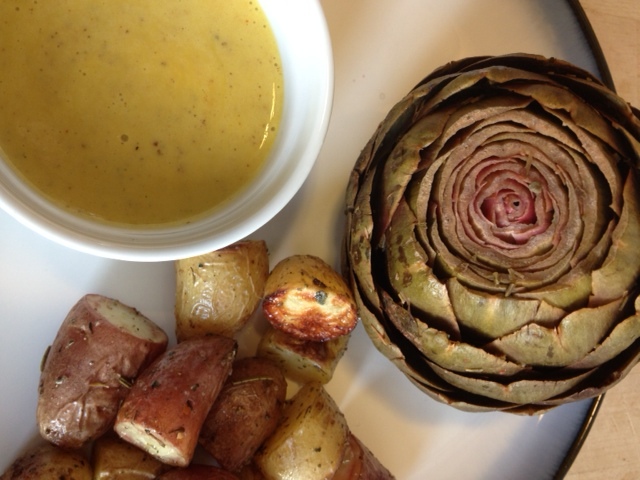 I think I am going to try it out today… a little 4th of July artichoke action, don’t mind if I do. « Fresh from the Farmers Market: It’s Goat Time!